When driving on a road that is not a freeway, drivers should look down the road at least ______ ahead of their vehicle. Drivers should always look down the road at least 12 seconds ahead of their vehicle, unless they are driving on a freeway. When on a freeway, drivers should look 20 to 30 seconds ahead of their vehicle. Looking ahead may help prevent sudden stops or turns. Signs that are brown indicate areas of cultural and historical significance or of public recreation. They can be a helpful resource when traveling in unfamiliar locations. Stop in the middle of the roundabout. A roundabout is a circular intersection that flows in a counterclockwise direction around a central island and usually does not include a traffic signal. 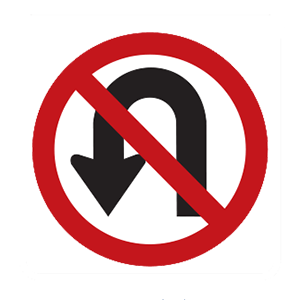 Motorists must enter, yielding to traffic already in the roundabout, and follow the circle to the right until their desired roadway is reached.